Representatives from Connell Foley, GEI, Honeywell and BASF presented various multi-party remediation models and success stories on sites along waterways. Honeywell representative, John Morris, praised the collaborative model that included USEPA, the Army Corps of Engineers and a non-government organization (NGO), the NY Buffalo Riverkeeper, which resulted in the successful cleanup of the Buffalo River. The river, a 6.2 mile, $44 million Superfund site, was a cost sharing initiative with USEPA that began with the urging from local citizens of the Buffalo River grass roots group. Roger Hathaway, GEI, discussed the former manufactured gas plant site of the Elizabeth River in Virginia. This collaborative model was a partnership of both public and private sector interests and The Elizabeth River Project, a non-profit; a utility, Columbia Gas; and the Virginia Marine Resource Council. They all joined forces to initiate cleanup of the river’s contaminated soil sediment in a project that moved expediently. Mr. Reid-Green from BASF presented his view of the obstacles faced during the continued cleanup of the Passaic River. Issues and conflicts arose among NJ regulators forced to take a conservative stance in their decision making, lack of developer involvement and distrust and disagreement from local NGOs, all of which have stalled the cleanup of the Passaic River. The result is a 30 year redevelopment time horizon for properties along the river, which is way too long. The important challenge that he put to BCONE members and the attendees of the Northeast Sustainable Communities Workshop is the crucial need for the community and stakeholders who want to see redevelopment to involve themselves in multi-party waterfront remediations. The redevelopment and citizen interest groups must emphasize the end uses that are important to the community so they are factored into river cleanup endeavors. Takeaway from the two success stories and the ongoing Passaic River project: Forming partnerships early and establishing a common goal with more collaboration are tactics vital to getting cleanup off the ground. Thanks to Denise Capparelli of CCLR for this summary from the May, 2017 NSCW. Brownfield remediation always involves various types of risk. Financial, environmental, or health-related, these risks can potentially undermine the success and completion of remediation and redevelopment projects. However, thanks to high-tech innovations and advancements in analytics, new tools attempt to minimize risk and propel successful remediation and redevelopment projects. Morgan Abele from Puls, Inc., Chris Gibson from VideoRay, and Zain Iqbal from JLT Specialty USA provided info to BCONE on robots, superdata and droned at a recent session at NSCW moderated by Skelly Holmbeck from Advanced GeoServices. Aerial drones are not the only new tool in the remediation arsenal. Chris Gibson of VideoRay discussed many ways remote operated vehicles are changing site assessment. Underwater robots equipped with sonar, video, and GPS have proven valuable throughout remediation and redevelopment. Compact enough to fit in your luggage, these robots are highly mobile, quickly deployable, and affordable. By accessing areas unsafe or inaccessible otherwise, underwater robots and underground imagery provide a window into the unseen. The ability to increase our understanding of a site reduces uncertainty in a remediation plan. These technologies greatly reduce uncertainty by improving our ability to assess a site,. Compiling the improved site assessment data together for holistic analysis provides a clearer picture of all potential risks. As a result, remediation and redevelopment are safer and more efficient. All of this is made possible by data analytics from robots, drones, cameras, and sonar. These technologies generate huge amounts of data. Zain Iqbal of JLT Specialty explained how the combination of improved site assessment and data analytics helps projects confront the challenge of risk assessment and safeguarding their redevelopment investment. Predictive analytics actually translates data into knowledge. This doesn’t just help project assessment and planning; it is now used to generate characteristic comparisons between sites. By targeting specific risks and potential losses, predictive analytics helps tailor the insurance options specifically to the optimal level for each project. This reduces unnecessary costs, decreases inefficiencies, and provides comprehensive risk analysis in conjunction with project planning. Technology is undoubtedly transforming brownfield remediation. These innovations are invaluable to revitalizing contaminated sites, now and into the future. BCONE thanks Andrew Welch of CCLR for this article and thanks Andrea Poinsett of GEI Consultants for editorial assistance. The Northeast Sustainable Communities Workshop (NSCW), BCONE’s main annual event, identifies the latest goals for sustainable development and helps to inform professionals of the newest strategies and technologies. As a young environmental lawyer and a first-time attendee, I saw an opportunity to gain insight on cutting edge of sustainability and the chance to network with some of the leaders of brownfield remediation. As a first time attendee, I was ready for a day of interesting seminars and to speak with the environmental companies that filled main halls. The seminars were full of information about the latest advancements and technologies in sustainable development: from thermal vapor absorption in urban areas to new coastal management strategies for New Jersey flood zones, the speakers gave their time and energy to present the hot topics in their expertise and generate energetic discussions on current events in brownfield redevelopment.. The day was capped off with a wonderful networking event where I was able to make connections with leaders in the field. In hindsight, I should have been sustainable in my travel decisions. Rather than driving the 2 hours, I should have taken advantage of the train or other public transportation so readily available to the NJIT campus in Newark, NJ. As I become more established in my career, the bounty of continuing education credits will be a bonus offered by a workshop filled essential seminars and insights to the multi-faceted environmental community. 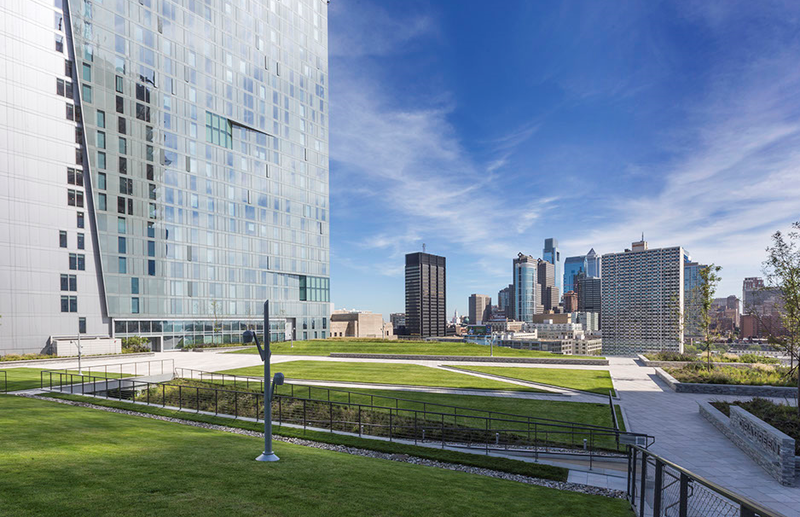 Walk out the eighth floor of Brandywine Realty Trust’s dazzling Evo Tower in Philadelphia and you encounter Cira Green – an urban park extraordinaire with over an acre of rolling green space suited for strolls, picnics, and events with a fabulous city view. Plateaued between two “vertical neighborhoods” (more on that later), Cira Green is the striking, dog friendly green space that transforms a parking garage into an urban gem. Conceived by Jerry Sweeney, Brandywine’s President and CEO, Cira Green and the entire LEED certified Cira Centre are the kind of sustainable innovation that is rejuvenating Philadelphia’s city scape. This is sustainable urban redevelopment at its best. 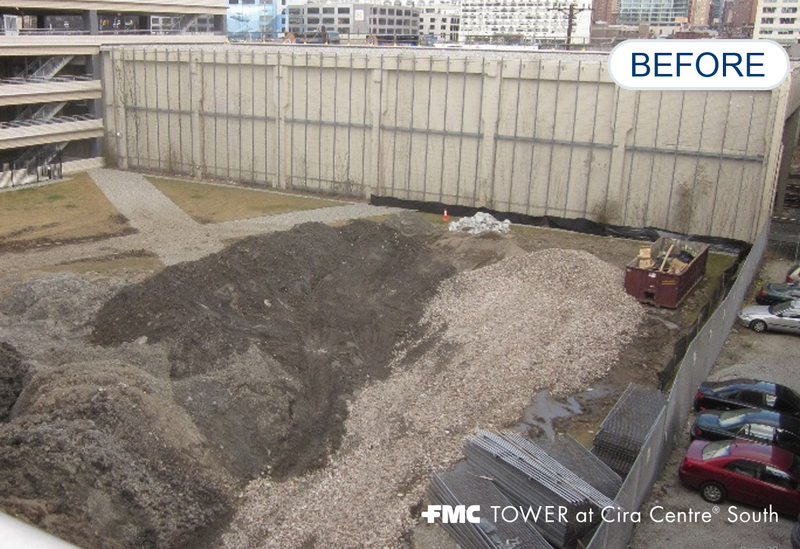 The technology under the park maximizes the ability of this space to serve as a stormwater management system that stores excess rainwater in a cistern, and reuses it to water grass, plants and trees on Cira Green. This is a self-contained ecosystem that does not generate stormwater runoff. The Delaware Valley Green Building Council recognized this site with its Groundbreaker Award. You do not have to live here to enjoy this space – it is open to the public, as long as you don’t bring more than 500 of your friends at once (maximum occupancy permitted on Cira Green is 500). 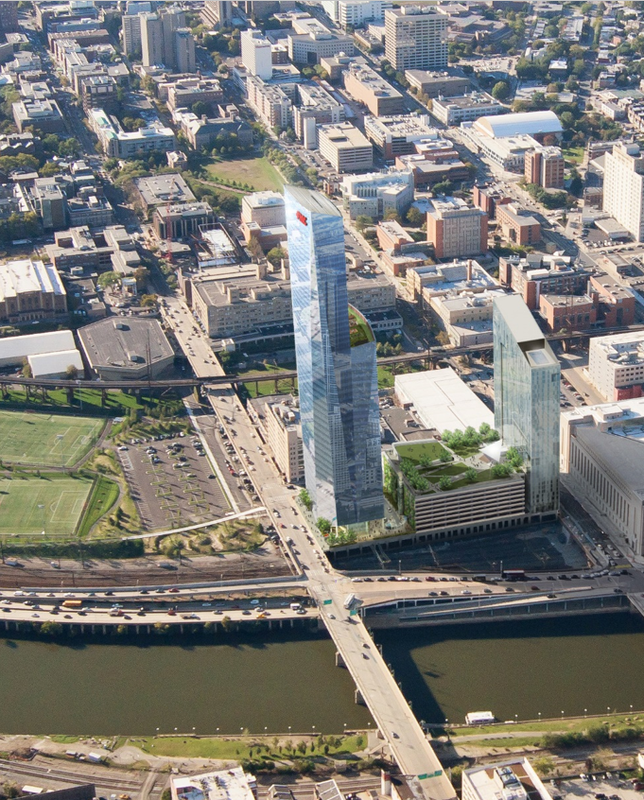 Adjacent to Cira Green is Evo Tower, the tallest “dorm” in the country, as well as FMC tower, a LEED Gold certified “vertical neighborhood” with more than 1 Million square feet of space on less than one acre of land that is home to FMC corporation, additional office space, ultra-luxury residences, hotel suites, a 72 foot pool, fitness center, theater, and a world class restaurant and a bar (run by Michelin star rated Rebelle from NYC). Research shows Philadelphia’s chance of becoming a top-tier city—with the attendant firms, jobs, revenues, and innovations that status would bring to the city and region—cannot hinge on individual acts or institutions. Given its assets and the progress it has already made, it is clear Philadelphia can rise to this collective challenge. With federal and state funding receding and the next-generation technologies that will determine the competitive cities of the future in rapid development, now is the time for Philadelphia’s leaders to fulfill the city’s full potential. The Brandywine Realty Trust team, with their ability to transform urban sites into sustainable, multi-faceted, world class communities, is leading the way. Paul Commito, Brandywine Realty Trust Senior Vice President and incoming Chair of the Philadelphia District Council of the Urban Land Institute, shared the story of this site and other innovative brownfield developments as Keynote speaker for the Brownfield Coalition of the Northeast’s Sustainable Communities Workshop on May 25, 2017. The Northeast Sustainable Communities Workshop brought together over 300 brownfield experts at the New Jersey Institute of Technology.